Fads come and go in the horse world. High fat diets or high carbohydrate diets have set the stage for 40 plus pages of supplements listed in any horse supply catalog. Why are all these supplements needed? The answer is high fat or high carbohydrate foods are not natural for horses. These diets have also caused misery for many horses by triggering metabolic syndrome. Horses were just not designed to eat large amounts of fat or carbs. The model natural diet for the horse is nutrient dense, low sugar and starch, grass or hay, supplemented with whole foods. So how do you know if your hay fits the needs of a horse on a model natural diet? The answer is, you have to test it or buy from a dealer who can supply you with an analysis. You would never consider buying a bag of feed that did not include an analysis so you need the same for your hay. A good lab to send your hay sample to is www.equi-analytical.com. Be sure and read all the instructions carefully so you get an accurate reading. The Trainer or Complete test will give you all the information you need on digestibility, sugar levels and minerals. You can get the average values for grass hay here http://equi-analytical.com/interactive-common-feed-profile/. You can get nutrient requirement tables here http://equi-analytical.com/nutrient-requirement-tables/. Once you have your analysis you will see where your hay is deficient or out of balance in minerals compared to most grass hay. Many experts suggest you have a custom mineral formula prepared using inorganic minerals but I prefer to balance the hay with whole foods. Why do I not like inorganic minerals? The answer is because these minerals are inorganic minerals. Inorganic minerals are not the same as organic minerals found in natural foods like fruits, vegetables and sea vegetables. The way elements of a compound are connected determines whether it is organic or inorganic. The elements of organic minerals as found in fruits and vegetables are loosely held together. The constituent parts of inorganic minerals are held together tightly; they have strong bonds that the body cannot break easily. This means that such minerals do not have the nitrogen bond attached to them in order to break them down easily and make them accessible to the body’s cells. Organic sources of balanced trace minerals includes a blend of AFA micro algae or a blend of several micro algae and sea algae. Another great product includes AFA algae, probiotics and wheat sprouts. Chia seeds are also a good source of minerals, omega 3 fatty acids and protein. Limited amounts of kelp can be a good source of salt and iodine. Herbs and vegetables can be great sources of individual minerals. Feeding a variety of these to compliment hay can mimic the horses natural tendency to forage to meet his nutritional needs. Herbs and vegetables can be offered to horses in a separate feed tub daily and by watching what your horse chooses you can determine what nutrients they are seeking. Examples of whole foods that are high in minerals include asparagus, broccoli, buchu leaves, cabbage, carrots, cauliflower, dandelion root and leaf, horsetail, kelp, milk thistle seed, parsley, oranges, pumpkin seeds, red raspberry leaves, rose hips and watermelon. Chopped veggies can make a great substitute for bagged feeds. Whole foods also provide vitamins, fatty acids, phytonutrients and proteins in the diet. Bagged feeds are generally high in sugar and contain GMO grains. Bagged feeds also contain synthetic vitamins. Real vitamins are intricate, interrelated, integrated, united organic nutritive groups. Nature made them as an indistinguishable part of foods for the benefit of human health. Vitamins are inseparable as working nutrients from trace elements, minerals, proteins, and other elements. Chemists have attempted to isolate and identify some of the components of these food complexes, labeling the seemingly “active” elements as vitamins or other nutrients. Yet there is no possible way that even the sum of the parts is equal to the whole. It is only the whole food, intact and unaltered, that works as a nutritional source. The isolated parts are not recognized by the body as foods. In large amounts, such isolated chemicals function more like drugs, which stimulate or suppress biochemical functions; not providing vitamins for the cells to carry on their vital activities. Natural, food-source vitamins are enzymatically alive. Man-made, synthetic vitamins are dead chemicals. Optimum horse health requires “live” biochemicals. It is simply a matter of chemistry versus biochemistry. Nutritious, balanced, low sugar and starch, grass hay or pasture makes up the majority of the Model Natural Diet for the Horse. The hay should be fed in a slow feed net or feeder to allow for continued, controlled consumption. 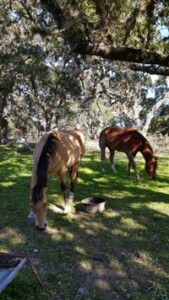 If your horse has access to pasture, grazing should be limited during times of high sugar, such as when the grass is stressed by drought or frost. Lush pasture grass should also be avoided as it can be very high in sugar and low in important minerals such as magnesium. Fresh veggies or herbs can replace bagged feeds. If bagged feeds are used, try to get one that is low in sugar and ideally contains non GMO ingredients.